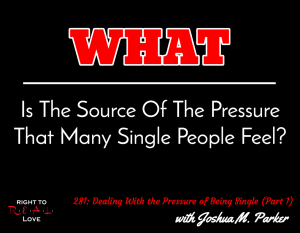 In this episode, Jay is joined by author Joshua M. Parker to address the question: What is the source of the pressure that many single people feel? How often do people feel pressure because they are unmarried or have not been in a relationship for a long time? Have you felt internal or external pressure because you are still unmarried? Do you feel more pressure to enter into a relationship or get married? What is the source of the pressure that many single people feel? Dealing with the pressure to settle. The impact of internal and external pressures. The need for more positive male role models. One of the biggest mistakes many singles make. Why we must be honest about our desires. Joshua explains why he feels pressure to get married.